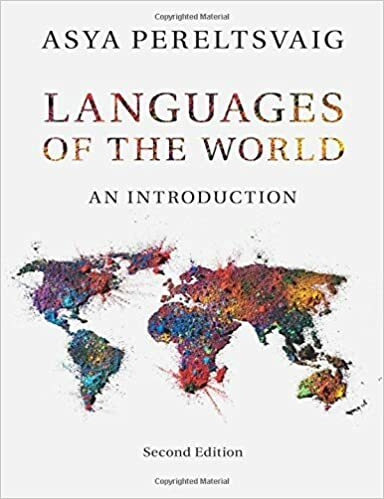 Although people talk about the “art of cartography”, map making and the visual arts such as painting or drawing are rarely discussed together, and their intellectual histories seem to run on separate lines. Yet both enterprises face the same fundamental challenge of representing a three-dimensional world on a two-dimensional surface. This post considers how cartographers and artists have dealt with this challenge in different epochs. The goal of a cartographer is to represent terrain, which is necessarily three-dimensional due to the spherical shape of the Earth, on flat media. 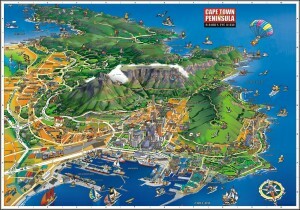 Various objects that can be mapped—mountains, rivers, buildings, etc.—are likewise three-dimensional. Mapmakers grasped the impossibility of creating a flat map of a curving surface long before it was proven that the Earth itself is spherical. Even those scholars who considered the Earth flat believed the sky was hemispherical so they too faced the challenge of creating a non-distorting flat map of a surface curving in all directions when creating astral maps. 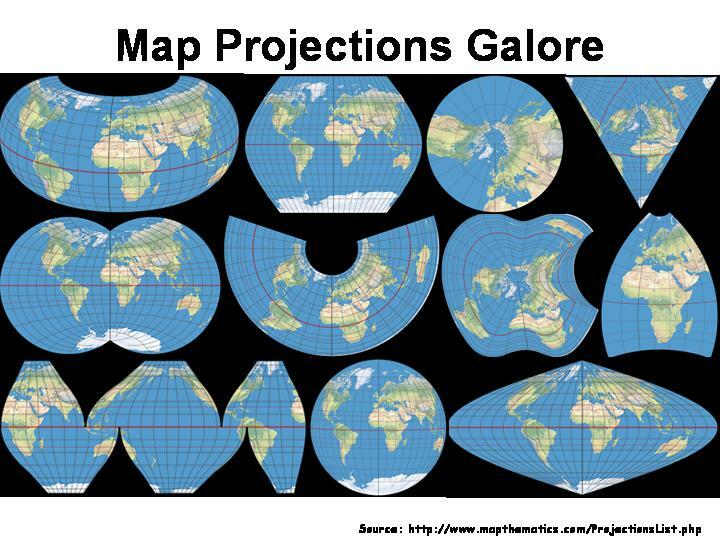 As a result, dozens if not hundreds of different map projections have been devised throughout history. As John P. Snyder notes in Flattening the Earth. 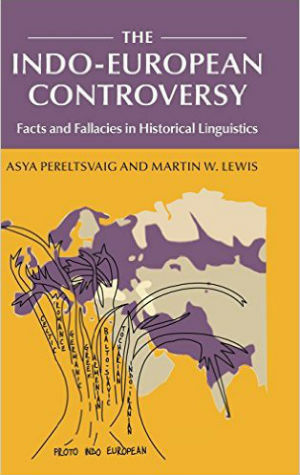 Two Thousand Years of Map Projections (University of Chicago Press, 1993, p. 1), map distortions “may take many forms—shape, area, distance, direction, and interruptions or breaks between portions. In other words, a flat map cannot correctly represent the surface of a sphere”. 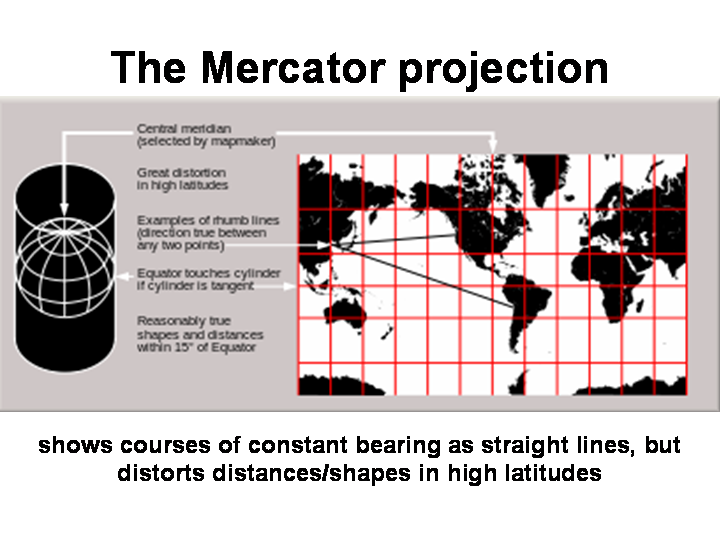 A well known example of cartographic distortion is found in the Mercator projection, named for its inventor Gerardus Mercator (1512-1594). 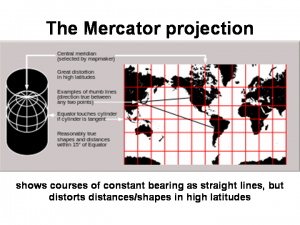 The Mercator projection, unlike all others, represents a constant compass bearing as a straight line, which makes Mercator-based maps particularly suitable for navigation. 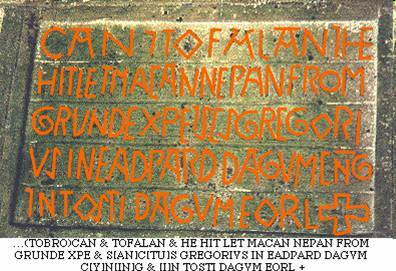 However, this geometrical feat is achieved at the cost of great distortions of both distances and shapes of landmasses in high latitudes, making Greenland appear to be about the size of South America. Similarly, artists (particularly painters) depict three-dimensional objects—people, landscapes, and everyday objects—on a flat surface: canvas, paper, wooden board, and the like. The impossibility of representing 3-D objects on a 2-D surface without distortions was mathematically proven by Boris Rauschenbach, a preeminent Soviet rocket scientist, mathematician, and art historian in his books, Spatial Composition in Painting and Spatial Composition in Old Russian Painting (on which this post draws heavily). Rauschenbach also considered how various artists from antiquity to modern times dealt with this challenge and used it to advance their artistic goals. For example, Caravaggio famously perfected the technique of foreshortening whereby objects extended along the line of sight are depicted as relatively shorter than objects extended across the line the sight (i.e. along the plane of the canvas). 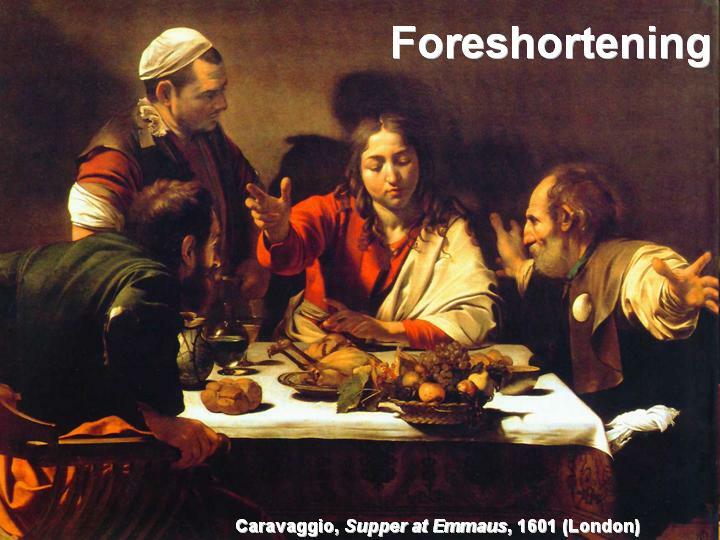 For example, in the earlier version of his Supper at Emmaus (1601, National Gallery, London), Christ’s right arm (extended along the line of sight) is shorter than his left arm (extended across the line of sight). 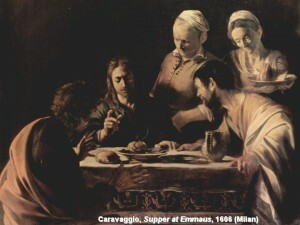 This technique serves to create the sense of depth, further accentuated by Caravaggio’s use of chiaroscuro—a technique of boldly contrasting dark and light areas, which helps create a sense of volume. Due to foreshortening, Christ’s right arm and the left arm of the disciple on the right appear to protrude from the canvas, as if to grab the viewer and to pull him or her into the composition of the painting. In effect, a visual distortion serves as an invitation for the viewer to become part of this important moment in the religious narrative. The dramatic effect of the foreshortening is particularly obvious from a comparison with a later, much more subdued version of the same scene painted by the same artist (1606, Brera Fine Arts Academy, Milan). Just as the challenge of “flattening” a three-dimensional world is faced by cartographers and artists alike, the ways in which the two groups addressed this challenge are also parallel. In Antiquity and the Middle Ages, map makers and artists often escaped the problem by depicting not the totality of space but only certain disjointed elements of the 3-D world. 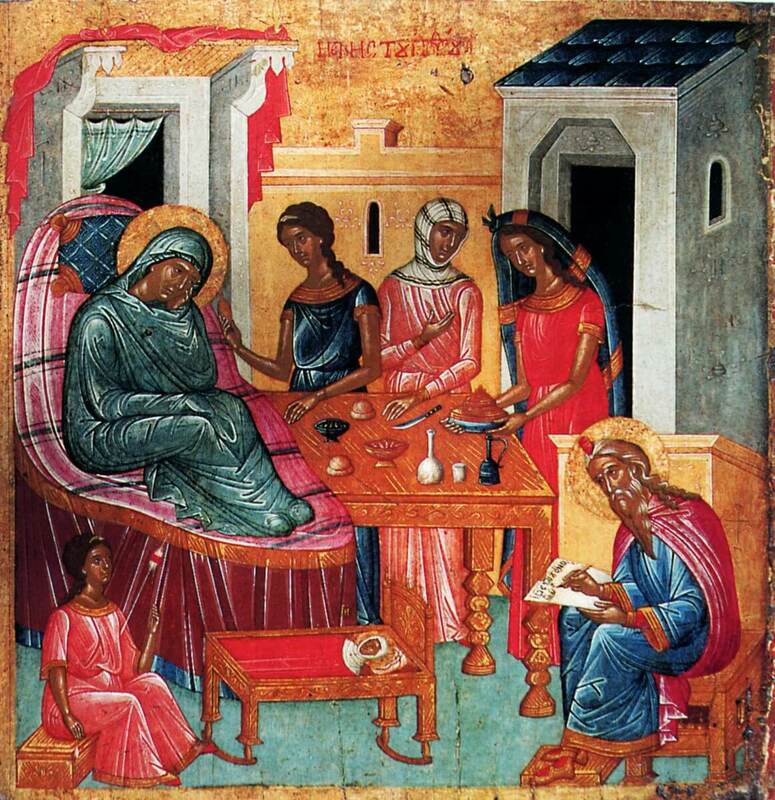 * Consider, for example, a 15th century Byzantine icon, Birth of John the Baptist (State Hermitage Museum, St. Petersburg), reproduced on the left. Various three-dimensional objects—John the Baptist’s cradle and the table in the center of the icon, the pulpit, the seat, and the footrest on the right, and the two buildings in the background—are depicted in axonometric projection, which shows parallel lines as such. 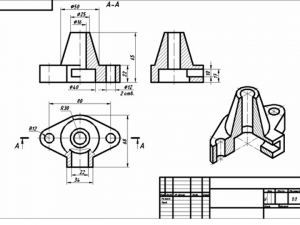 In general, an axonometric projection shows an image of an object as viewed from a skewed direction in order to reveal more than one side of it. For example, we see three sides of John the Baptist’s cradle: the front, the side, and the top. Each object, however, is depicted separately; there is no unifying perspective, as if one views each element from a different viewpoint. The separate depiction of each object in an axonometric projection creates a certain “cluttering” effect, whereby elements of the background look like a theatrical backdrop, too close to the foreground elements. 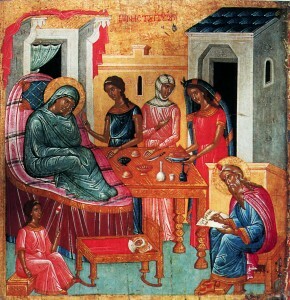 This phenomenon is particularly visible in a comparison of two 15th century Russian icons of the Holy Trinity: one from Church of the Deposition in Borodava and the other painted by the great Russian artist Andrey Rublev (the two icons are reproduced on the left). 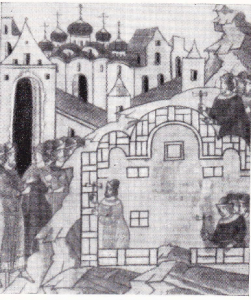 Both artists relied mostly on the axonometric projection; however, in the Borodava icon the background appears to be much closer to the foreground. Rublev dealt with the gap between the foreground and the background in a more delicate way, masking it by the overlapping and nearly blending images of the angels’ wings. This “curtain” of wings creates a sense of depth, pushing the building and the Oak of Mamre, included for symbolic reasons, farther into the receding background. 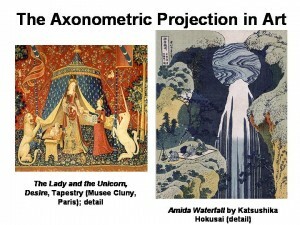 The axonometric projection was commonly used in medieval art. One well-known example is the depiction of the bench and box in The Lady and The Unicorn, Desire tapestry (reproduced on the left). 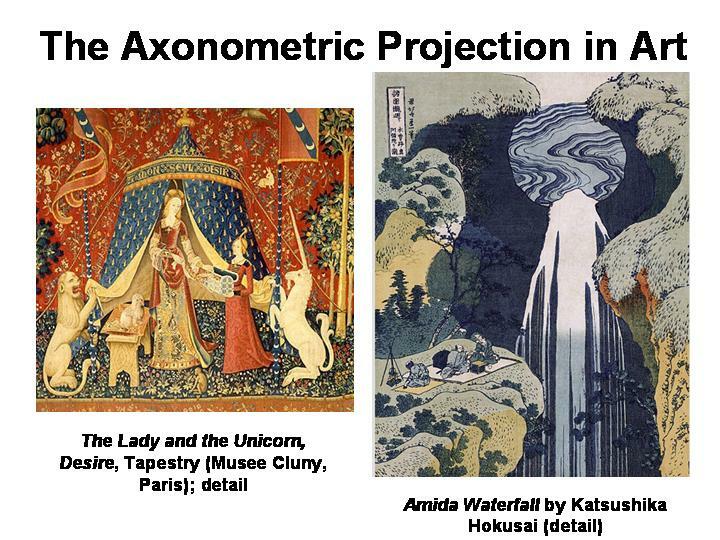 The same projection is also found in works of later Asian masters, such as Katsushika Hokusai, who used it to depict the three carpets and the box in the left part of the Amida Waterfall. Such heavy reliance on the axonometric projection in pre-modern art is understandable, as medieval artists generally drew not from nature but from memory, thus depicting not concrete objects in their visual field but abstractions of such objects as “cradle”, “box”, “bench”, and the like. An axonometric projection is also useful for the common medieval focus on anthropomorphic depictions of the deity and angels, surrounded by everyday man-made objects. As pointed out by Rauschenbach, such relatively small objects viewed from a short distance of 2-3 meters (6-10 feet) or less are seen by a human eye—in conjunction with the human brain—in the axonometric projection, which also explains why the furniture in the icons reproduced above look more “natural” than the images of larger structures, such as buildings. Similar depictions of discrete objects as separate, haphazardly compiled ensembles without a unifying metrics, are found in cartography as well. Pre-Renaissance maps often depicted some geographical entities with relative accuracy, with shoddy representations of the space between them. This is particularly evident from the world map reproduced on the left, where coastal contours of Europe, Africa, Southeast Asia and the eastern contours of the Americas are reproduced far more faithfully than the space between them. The shapes of the Caspian Sea and the Indian subcontinent are grossly distorted; California is shown as an island (a mistake reproduced on numerous maps well into the 18th century); and both the northeastern part of Asia and the western part of North America dissolve into nothingness. 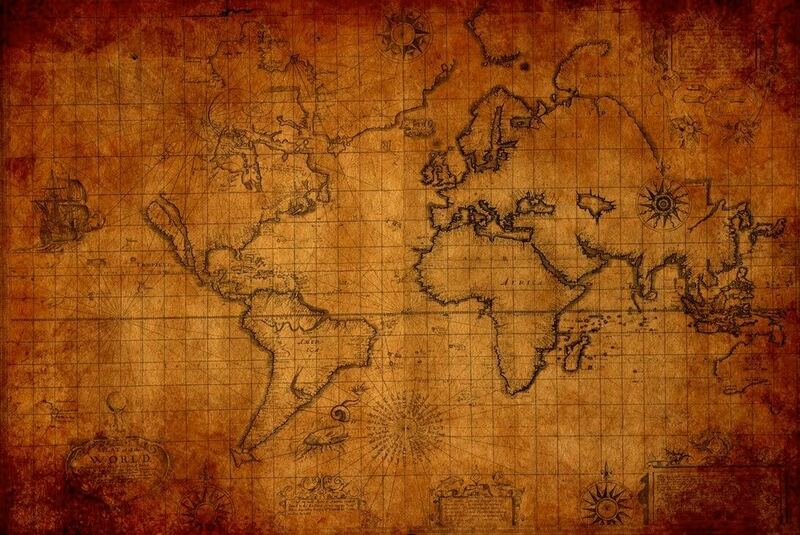 Some of these problems, of course, stemmed from a simple lack of knowledge, as well as from the fact that latitude could be measured relatively accurately whereas longitude could not be fixed until the late 1700s. It was not until the Renaissance that artists and cartographers began to consistently depict the totality of space rather than discrete objects cluttered in “empty space”. The discovery of a unified linear perspective (or more precisely, re-discovery) based on a square grid, as shown in Albrecht Dürer’s print reproduced on the left, revolutionized art, allowing artists to apply common geometric rules to objects and the space between them. 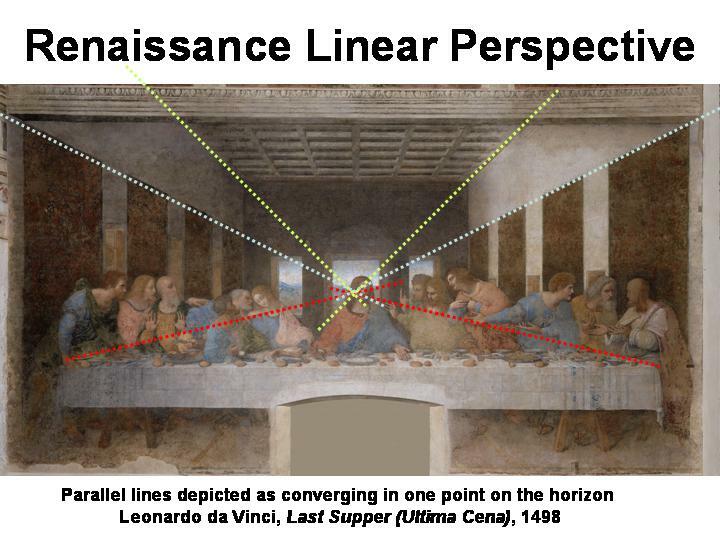 In linear perspective, parallel lines are depicted as converging in one point on the horizon. 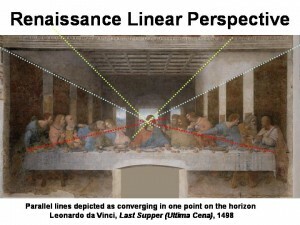 This technique is apparent in Leonardo da Vinci’s Last Supper (Ultima Cena), where the parallel lines representing the sides of the table, the tops of the tapestries on the walls, and the sides of the ceiling panel converge in one point. In this masterpiece, Leonardo artfully uses linear perspective not only to give a sense of depth but also to draw the viewer’s gaze towards the focal point of the painting: Christ’s face. Once again, a compositional technique aimed at representing the third dimension also serves to highlight the artist’s message: here, the centrality of Christ. Besides leading to the depiction of discrete objects in “empty space”, the lack of a unified viewpoint in pre‑Renaissance cartography and art led to another way of flattening the world: the use of such drafting techniques as that of combining views from two or three different angles on the same flat surface. 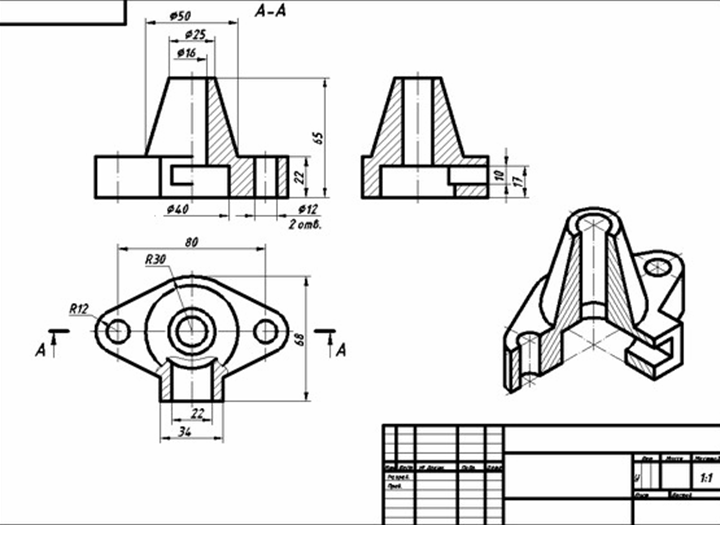 For example, a blueprint of a part reproduced on the left shows the projection of its complex geometry onto three surfaces: as it is seen from the front; from the left side; and from above. 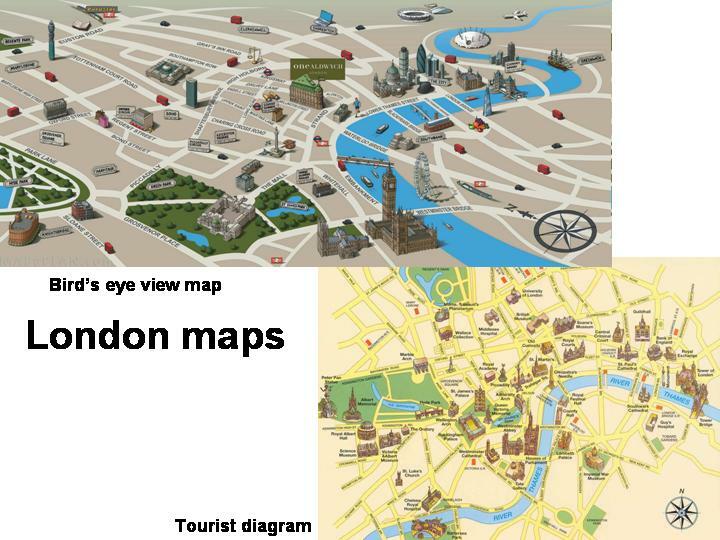 Combining views from different angles on a single plane has been a common technique in art, and as we shall see below, in certain types of maps as well. 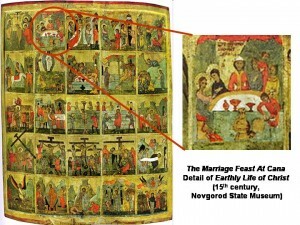 Consider, for example, the depiction of the table in the Marriage Feast at Cana detail of the Earthly Life of Christ, a 15th century Russian icon (Novgorod State Museum). Each element of the table is represented in its characteristic projection, most familiar to the viewer: the façade of the table with the hanging green side-cloth is shown from the front, as are the red vessels,, while the white tabletop is shown as viewed from the top (the round tabletop is represented by a semi-circle because a full circle would require a break in the image, creating further compositional difficulties in the placement of human figures around the table). Note that the bases of the vessels are placed on the line representing the top of the green table front, which is exactly how they would be seen from that angle. 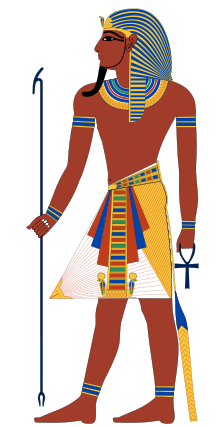 The same combination of different angles also characterized ancient Egyptian painting, where human figures—especially those of the pharaoh and his retinue—are typically depicted in a “twisted” fashion: the head, the hips, the legs, and the arms are represented as facing sideways, whereas the shoulders and the upper torso are shown en face. Note that the eye, despite being placed on a profile of the face, is also shown as seen en face. This combination of different projections in one image allowed the ancient Egyptian artists to show each body part from the most characteristic angle from which the given body part can be seen in its ideal form. This conventionalized perfection of each body part enhanced the message of the pharaoh’s overall perfection, physical and spiritual. This technique of distortion suited impeccably the goal of depicting an idealized rather than a realistic image of the pharaoh. The idea of depicting objects from different viewpoints independently made a comeback in the early 20th century in the form of cubism, an art movement said to have revolutionized European painting. The goal of cubism’s deconstruction was indeed revolutionary: to represent the subject in a multiple contexts. 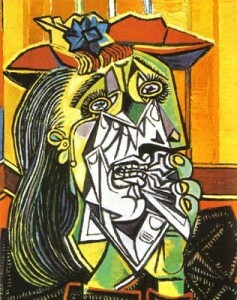 The technique used to achieve this goal, however, was nothing new: like ancient Egyptian painters or medieval icon masters, Cubists such as Picasso relied on multiple viewpoints and the combination of projections onto different planes in a single plane. Going back to ancient and medieval art, one can see that the same combination of multiple projections was used also in what can be termed loosely “landscape painting”. The fragment of the ancient Egyptian painting Garden of Nebamun from 1400 BCE found in Thebes (reproduced on the left) depicts a garden surrounding a rectangular pool with birds, fish, and reeds. 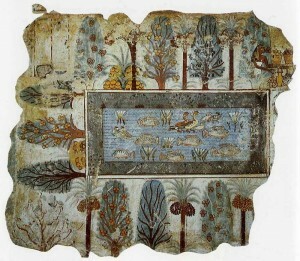 Each element is represented from a different viewpoint, selected in each case to best highlight its shape: the trees are shown from the front, as are the birds, fish, and plants inside the pool, while the pool itself is seen from the top. Note also that the bases of the trees above and to the left of the pool are placed on the line that represents the edge of the water (the trees on the left are turned 90° sideways), which is exactly how the trees would be seen if viewed from the front (the similarity with the placement of the vessels in the 15th century Russian icons discussed above is striking). 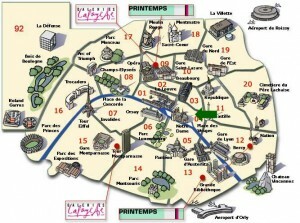 This way of representing a landscape is reminiscent of a certain genre of map used by tourists to navigate a city or town. 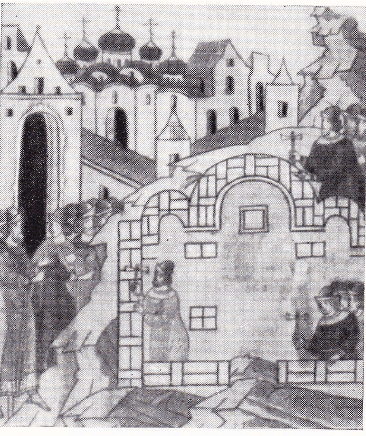 Another example of artwork that borders on a map is a miniature from an illustrated 16th century Russian chronicle portraying the founding of the Church of St. Michael in Novgorod. It includes not only a depiction of the church as if already built (in the traditional axonometric projection), but also the floor plan of the church, which made it clear to the viewer that it would be a triapsidal church with a four-post design. 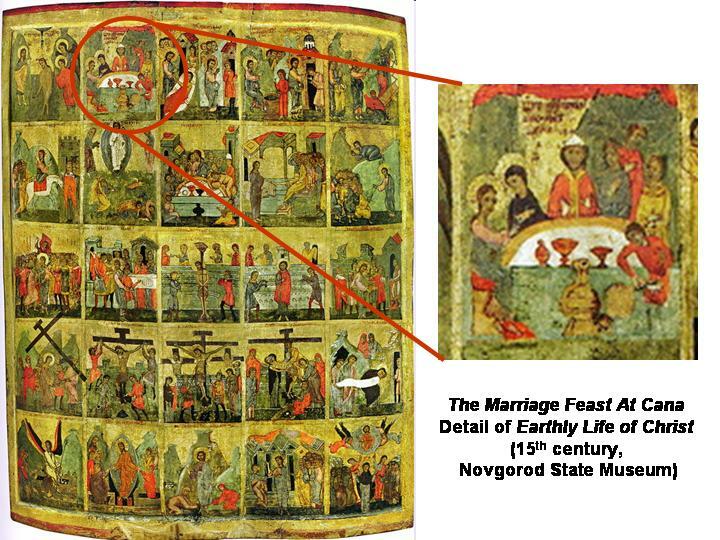 Even more map-like is the depiction of the Trinity Monastery of St. Sergius in a 17th century Russian icon reproduced on the left. 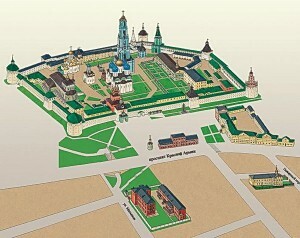 This is clearly a plan of the monastery, depicting the relative position of the walls, towers, churches, and other buildings, as they would be seen from the top. Yet to make the image more informative, the structures themselves are portrayed as seen from the front or from the side—just as a visitor to the monastery would see them. Such features make this icon functionally similar to the “bird’s eye views” of the monastery designed for today’s tourists, reproduced on the left. 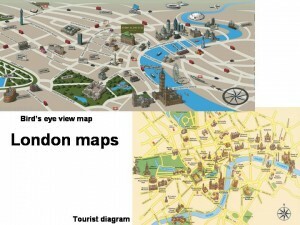 However, the two images differ in an important way: the modern “bird’s eye view” diagrams use a unified perspective (more on which below), while the icon combines multiple viewpoints. 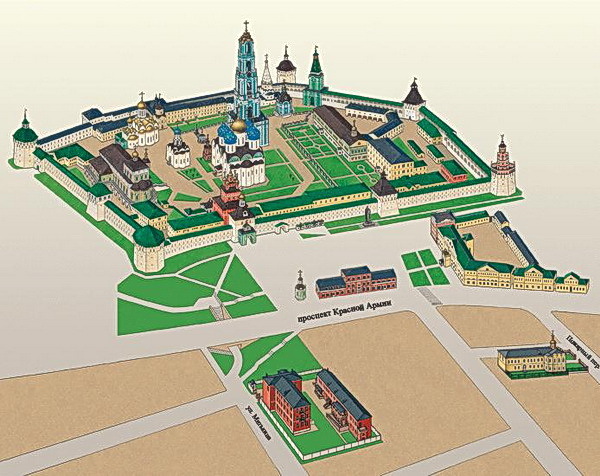 Thus, in its design the Trinity Monastery icon is more similar to the popular style of modern tourist diagrams that combine a regular map (view of the terrain from the top) with a depiction of selected monuments using independent axonometric projections. 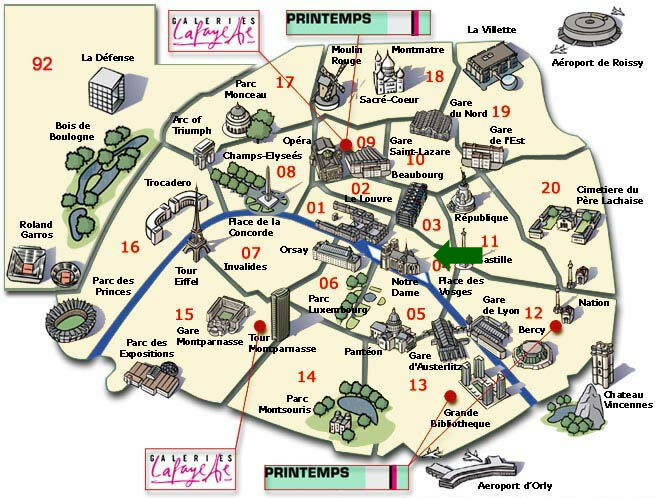 Such a scheme is clearly visible on the diagram of Paris reproduced on the left (note particularly the shape of the Grande Arche of La Defense in the northwest). The intellectual histories of map making and of visual arts cross paths in another way as well: modern technological developments shifted the course of both, yet in the opposite directions. While both cartography and painting are concerned with “flattening” the three-dimensional world, they have traditionally concerned themselves with 3-D objects on different scales: map makers typically represented large swaths of the world, too large in fact to be seen by a pair of human eyes, while artists usually concerned themselves with visible chunks of the world, trying to reproduce noticeable reality as closely as possible. However, the 1839 invention of photography, immediately seen as superior to painting in its ability to faithfully represent reality, prompted many artists of the Victorian era to elude competition with the photographic lens by attempting to paint what they called “the Unseen”. 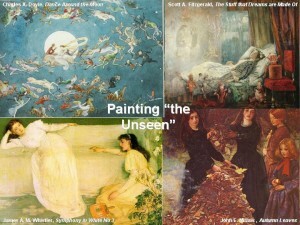 Specific subjects varied from imaginary worlds to the non-visual senses. For instance, Scott A. Fitzgerald, Charles A. Doyle (the father of Sir Arthur Conan Doyle), and Joseph N. Paton turned their attention to the “fairy world”, especially as imagined in Shakespeare’s Midsummer Night’s Dream; Fitzgerald was also interested in depicting dreams. (Note the particularly “flat”, perspective-less depictions of the fairy and dream worlds in the images on the left.) Pre-Raphaelite painters, especially Dante Gabriel Rosetti, were interested in painting raw human emotions; James A. M. Whistler sought parallels between painting and music, titling many of his paintings “arrangements”, “harmonies”, and “nocturnes”, whereas Sir John Everett Millais’ Autumn Leaves is said to have been inspired by “the odour of burning leaves … the incense offered by departing summer to the sky…” (Jeremy Maas, Victorian Painters, The Cresset Press, 1969, p. 129). Other artists turned to depicting not what the eye alone sees (which is also captured by a photographic lens), but how the brain adapts the retinal image. 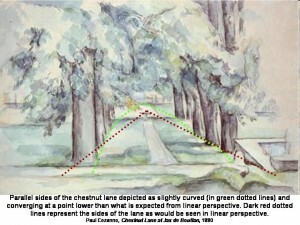 Eschewing the Renaissance-style linear perspective, artists like Paul Cézanne used what Rauschenbach calls “perceptual perspective”, which is based on the brain’s corrections of the retinal image. When it comes to landscapes, the perceptual perspective differs from linear perspective in several important respects: in the former, faraway objects appear larger and the horizon higher, while parallel lines in the foreground appear as (nearly) parallel. In the middle ground and background, parallel lines appear as crossing on the horizon, in both perceptual and linear perspectives. In effect, we see parallel straight lines, such as rails, as slightly curving (though the brain’s mechanism of shape constancy tells us that the rails are straight). 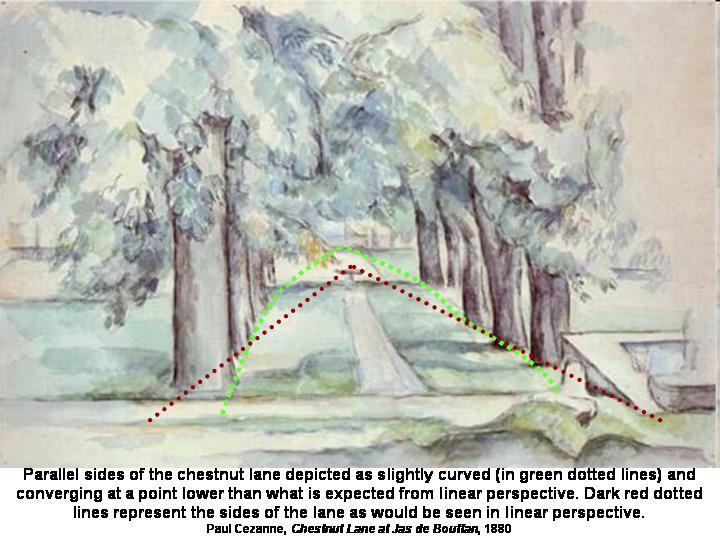 This is exactly how the two parallel sides of the chestnut lane are painted by Cézanne (see image on the left). In cartography, modern technological innovations led to an opposite development, opening up a possibility of mapping large chunks of the Earth’s surface that now can be seen from far above, including the growing popularity of the so-called “bird’s eye view” maps and satellite-based maps of the Google Earth variety. Unlike the tourist diagrams, discussed above, which depict the terrain as seen directly from above, bird’s eye view maps represent both the terrain and the structures built on it as seen on an angle—the same angle for all the objects depicted. 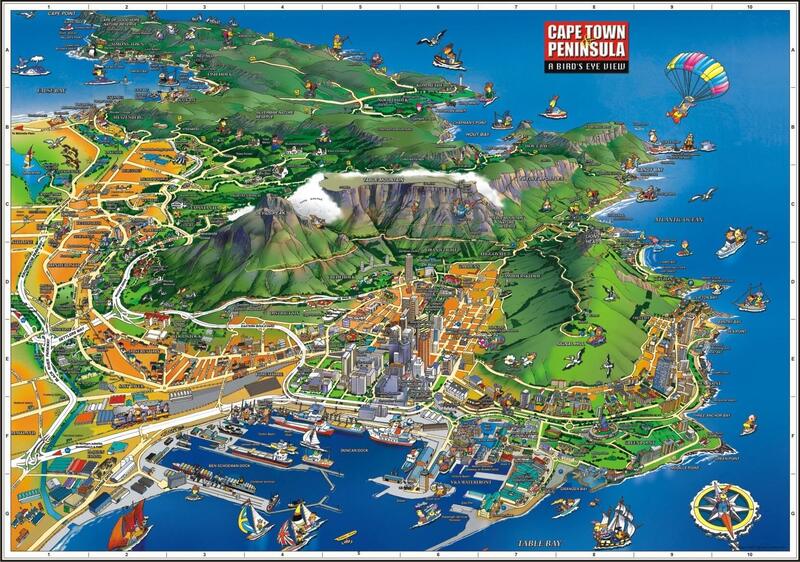 Like the Trinity Monastery icon discussed above, which embeds a map of sorts, the most artistic examples of bird’s eye view maps, such as the one of Cape Town area reproduced on the left, straddle the border between cartography and art. *Ancient Greeks were an exception as they appear to have known linear perspective in art and to have had mathematical map projections. This knowledge was subsequently lost and rediscovered during the Renaissance.